A P Harper was a founder member of the New Zealand Alpine Club. Gain green spur on the true right of the waterfall, then link together a series of terraces and spurs that lead to the lip of the upper waterfall. Beyond this is the huge ice/snowfield under the eastern flank of Mt Harper. Ascend the snow until the rock is gained at the low saddle, then to the summit on loose rock/ice. 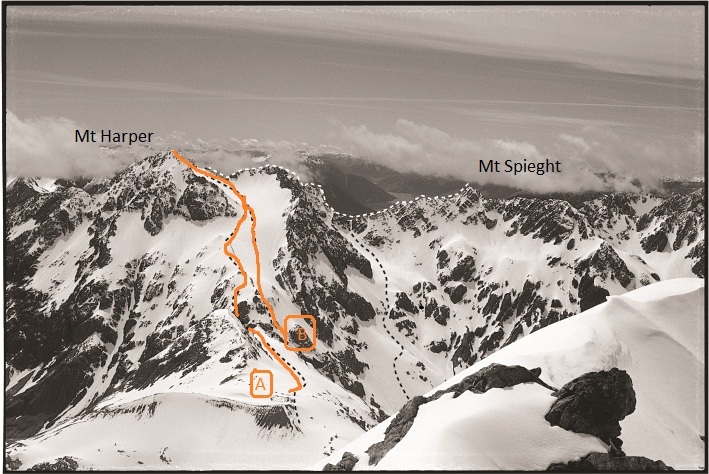 This route is best achieved by following the first side creek met when leaving Carrington Hut towards the cableway. Once through the initial bush bash, keep to the true left of the creek (about 50–60m), some old rock cairns may be found. A steep scree gully is intercepted that leads through a visible gut in the cliffs to reach the easier slopes below the bushline. From here cairns lead to the broad tussock slopes of the ridge (an old trig station will be passed). The final ascent is on snow slopes, a steep rock pinch, then easy ridge to the summit. Some 1994 earthquake damage may prevail on this route. This face has surprisingly good rock, the shortcoming being that it hasn’t had enough ascents to dislodge the numerous chockstones and loose scree jammed in its rifts and cracks. The best approach is from White Col, sidling out northwards until standing beneath the chosen route. Most of the obvious lines provide plenty of 'cam breaks'. The going towards the South Ridge gets a little scrappy, but otherwise provides some good cranking. The face isn't recommended after fresh snow, as airborne avalanches wash the entire wall. Can be approached by the steep South West Face and Ridge (reasonable rock and lines) from White Col. Normally climbed from White Col, via the large southern snowslope joining the South West Ridge to the summit.